Any audiophile will venture towards the pages of a hi-fi magazine from time to time – if they’re not avidly reading them every month, that is. Had you picked up a copy of What Hi-Fi in 1977, the chances are that by the time you’d finished it, you would know that this amplifier was the one to buy, under £100. Why then has it disappeared into the mists of time, with barely any mention four or so decades later? The answer is the NAD 3020 which arrived just eighteen months later; it effectively wiped this small, talented, budget amplifier off the map. Back in the mid nineteen seventies, the 33W RMS per channel (into 8 ohms) that this shiny silver JVC integrated amplifier packed was a lot. Lest we forget, Fidelity music centres were being sold through Boots stores in Britain with one tenth of that rated power, and this was regarded as acceptable. The JAS-11G wasn’t quite as impressive when you drilled down into the detail however; when the impedance halved, instead of the power output nearly doubling (as it should), it rose to a giddy 37W RMS per side from its Sanyo STK0040 power modules. Still, one should never forget the standards of the day; the (then) new Triumph TR7 sportscar was considered ‘quick’ with 105BHP back then! Other vital statistics of this amplifier include a damping factor of 30, 0.06% THD at 1kHz at 30W output, and a signal to noise ration of 95dB (line input); all solid stuff. The JVC was a looker. The fascia was a 390×152 slice of brushed aluminium; not quite ‘full width’ 430mm width of today but there was no standard size back then; and the black painted pressed steel case stretched 330mm behind it. 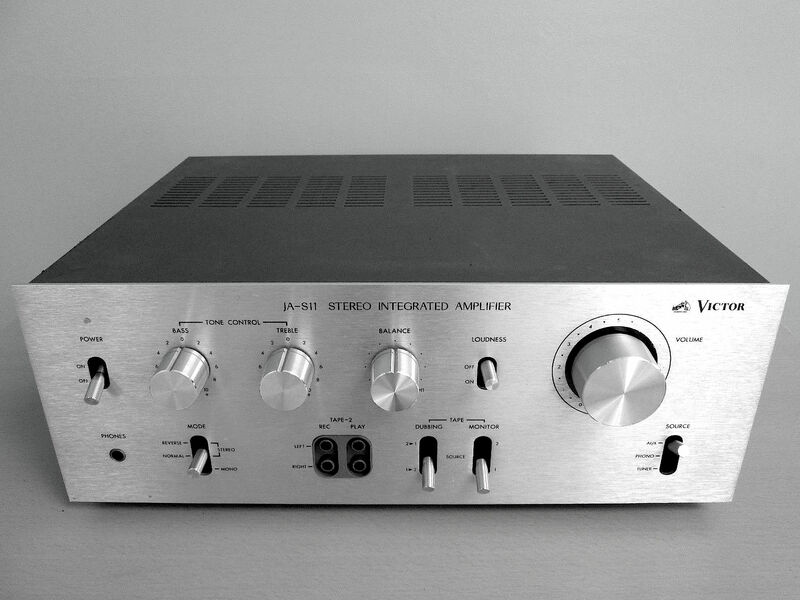 The controls were crisp and neat, and switching for tape dubbing (plus the unusual provision of a pair of second tape inputs and output sockets on the front panel) marked this 7kg amplifier out as being more lavish and ‘high end’ than any of its price rivals. Also, JVC chose to fit a stereo mode switch which – as was the trend back then – included reverse. Everything else was standard stuff, including the large, chunky volume control knob, about which the owners of Amstrads, Sinclairs and Fidelitys of this world could only dream. Sonically, the JVC isn’t bad. Clean and crisp sounding, it has a solid bass by the standards of the day and a nicely musical gait, which means that music flows along well. By 2015 standards of course it is rather opaque and lacks dynamics, but it gives a Phil Spector-like ‘wall of sound’ that would have impressed any hi-fi buyer in Laskys with £90 burning a hole in his pocket back in 1977. These days, this amplifier sells for pennies secondhand; it’s not a cult amplifier like the NAD that followed it in the affections of magazine reviewers, and you can do better elsewhere – Trio’s KA3700 rival of that time is slightly smoother and more organic sounding. All the same, if you see one that may otherwise be heading towards the skip, save it.